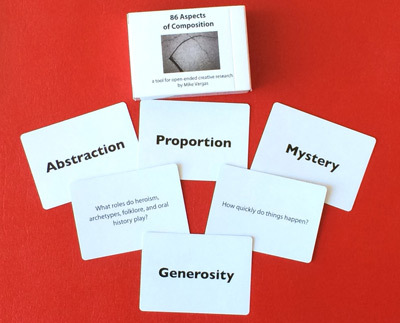 Adapted from the MV article in Contact Quarterly magazine Vol 28.2, “Looking at Composition is Like Painting the Golden Gate Bridge: 86 Aspects of Composition,” this deck of 90 cards is designed to support the process of organizing materials, perceptions, and decisions related to sound, movement, or any other artistic medium. The 86 aspects can be used as lenses to evaluate and analyze art, but they can also focus our attention on the composition of nature and the environment. There is a single aspect on each card, and on the back is a corresponding question related to the aspect.